This documentary, the latest from award-winning Irish filmmaker Arthur MacCaig, traces the history of Ireland through her music, and Ireland's music through her history. A SONG FOR IRELAND reveals how the nation's rich musical heritage has been influenced by its long and tumultuous political struggle, one in which music and rebel songs became cultural weapons in its anti-colonial resistance, which continues today in Northern Ireland. 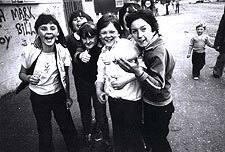 A SONG FOR IRELAND uses archival footage to chronicles highpoints in Irish history -- from the 1916 Easter Rising, the 1969 birth of the Civil Rights movement in Northern Ireland, and England's establishment of the Special Powers Act, to the 1981 IRA hunger strike, and the current peace process-interweaving throughout the film interviews with, and performances by, leading Irish and Irish-American musicians. Filmed in Derry, Belfast and New York City, A SONG FOR IRELAND features such talented musicians as Chris Byrne (Seanchai), Declan McLaughlin (The Whole Tribe Sings), Eileen Webster, Pol McAdaim, Maria Cahill, and the Wolfe Tones, who were filmed at the Ardoyne Fleadh in Belfast, the largest community festival in Europe. 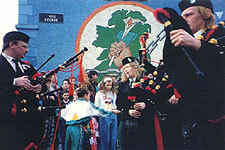 The film also includes a rare portrait of Brendan 'Bik' McFarlane, an IRA leader imprisoned during the Eighties, and today a composer and singer, whose "Song for Marcella" was written in honor of his friend Bobby Sands, the first of ten men to die in the hunger strikes in Long Kesh prison. McFarlane, along with Terry 'Cruncher' O'Neill and Manuel McFarlane, fellow members of the Belfast musical group Tuan, perform a number of songs and explain the historical and political roots of Irish music. A SONG FOR IRELAND, a documentary that entertains while it informs, vividly illustrates how, in countries like Ireland, making history and making music go hand in hand.